Building open from 8:00 a.m. to 5:00 p.m.
Tours available at 9:00, 10:00, 11:00 a.m. and 1:00, 2:00, 3:00, 4:00 p.m.
Building open from 10:00 a.m. to 5:00 p.m.
Tours available at 10:00, 11:00 a.m. and 1.00, 2:00, 3:00, 4:00 p.m.
Building open from 1:00 to 5:00 p.m.
Tours available at 1:00, 2:00, 3:00, 4:00 p.m. 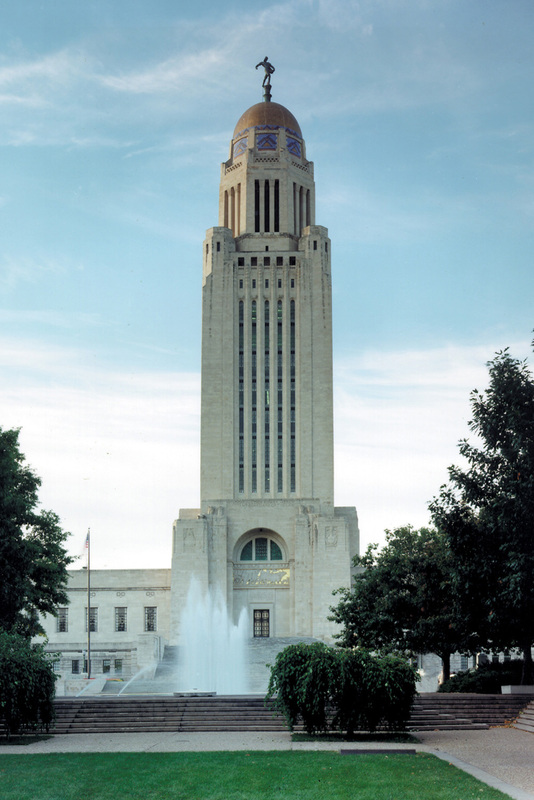 The Grounds and Promenade of the Nebraska State Capitol are open from sunrise to sunset, weather permitting. No running, jogging, bicycle riding or pets allowed on the Promenade Deck. Owners should clean up after pets on the grounds. The West Plaza (Lincoln Monument Plaza) and lower North Terrace may be available, weather permitting, for scheduled events between 6:30 a.m. and 10:00 p.m. The Capitol is closed Thanksgiving Day and the Friday after, Christmas Day and New Year’s Day. For more information about the free guided tours of the Nebraska State Capitol please call (402)471-0448. No pets inside the Capitol. School and group tours should be scheduled in advance and visitors may join these scheduled tours or tour the Capitol on their own. The schedule of groups booking tours in advance varies throughout the year with school tours generally occurring in March, April and May, and day care groups coming on Tuesday and Thursday at 10:00 a.m. and 1:00 p.m. during summer months. Please call the tour office to learn the days’ schedule and what groups may have scheduled in advance. Anyone needing auxiliary assistance should contact the tour office at (402)471-0448 at least ten business days prior to their visit. Service dogs are welcome in the Capitol. There is accessible parking on K Street to the east and west of the base of the Grand Staircase on the north side of the Capitol. There are six marked stalls, two are van accessible. The accessible entrance is beneath the Grand Staircase. The accessible elevator for second floor and the three branches of government is in Room #1009 to the right as you enter the north door. The north tower elevators (northeast and northwest) provide access to tower offices and the 14th floor observation level and the Memorial Chamber. The elevator doorways are 28” wide and are large enough for most wheelchairs. Capitol Security has wheelchairs which fit the tower elevators. The exterior observation decks are three steps below 14th floor level, however it is possible to view the city from the door opening. For those with special accessibility concerns the Tour Office has a videotape showing the view from the 14th floor observation deck available. Accessible restrooms are located on ground floor in the four outer corners of the square base of the capitol, and on second floor in the outer northwest and southwest corners. There are additional restrooms by the tour office at the north entrance on second floor. The Office of the Capitol Commission has created a family space in the women’s rest room across from the Capitol Dining Room on ground floor south center corridor. The space features a locking door, a chair, a long counter with electrical outlet, and hooks for coats and bags. This room is available for all visitors and staff needing a private place to attend to the needs of families with children. The Capitol Gift Store is operated by History Nebraska and is located in the south hall of ground floor. Open Monday through Friday from 9:30 a.m. to 4:30 p.m., the store has Nebraska and Capitol related items, books, gifts and educational items for children. Please call (402)471-2062 for more information. A cafeteria-style dining facility open Monday-Friday from 11:00 a.m to 1:00 p.m. is located on the east side of ground floor in Room #1301. Phone (402)467-5505 for information. Vending rooms and public telephones are located on 1st and 2nd floors of the Capitol. Accessible rest rooms are located on ground floor in the four outer corners of the building, and on second floor in the outer northwest corner. There are drinking fountains on ground floor adjacent to the rest rooms.